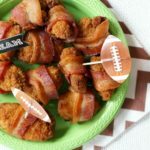 This Chicken Nugget Dinner on a Stick recipe is a sponsored post written by me on behalf of Tyson Foods, Inc. All opinions are entirely my own. 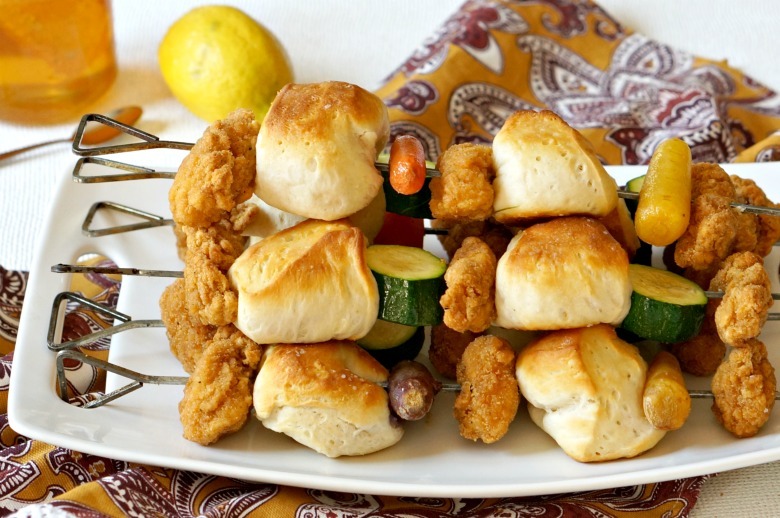 Chicken Nugget Dinner on a Stick is the recipe you need for happy family dinners this summer! 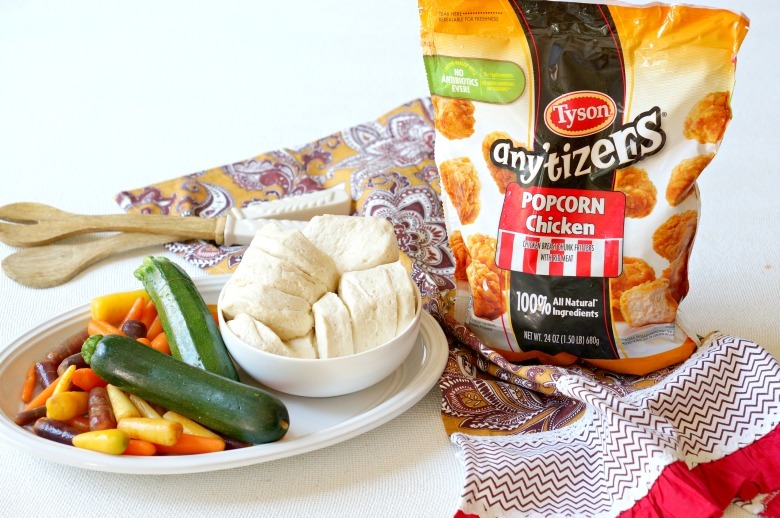 Mix and match veggies with biscuits and Tyson® Any’tizers® Popcorn Chicken for a meal all will love. 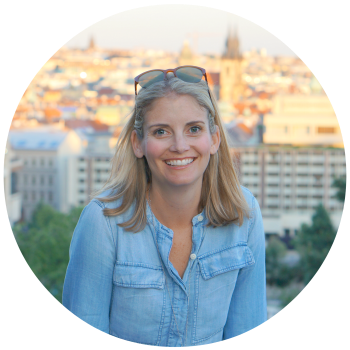 As a mom with three young boys (and a husband), I often feel like a short-order cook. But in the summer? My kitchen is in over-drive. Breakfast, lunch and dinner?!? Why is it always meal time? It should come as no surprise, that I have a couple of tricks up my sleeve to help stem summer mealtime mayhem. It’s called compromise. Except for in this “compromise”, everyone gets what they want. Sure you’ve heard of One Pot Wonders and Sheet Pan Suppers. Why not dinner on a stick? Not only can you customize the kabobs for individual tastes, but pretty much everyone loves food on a stick! And cleanup is still easy-peasy. The kids beg for Chicken Nugget Dinner on a Stick, and I don’t say no! Why would I? 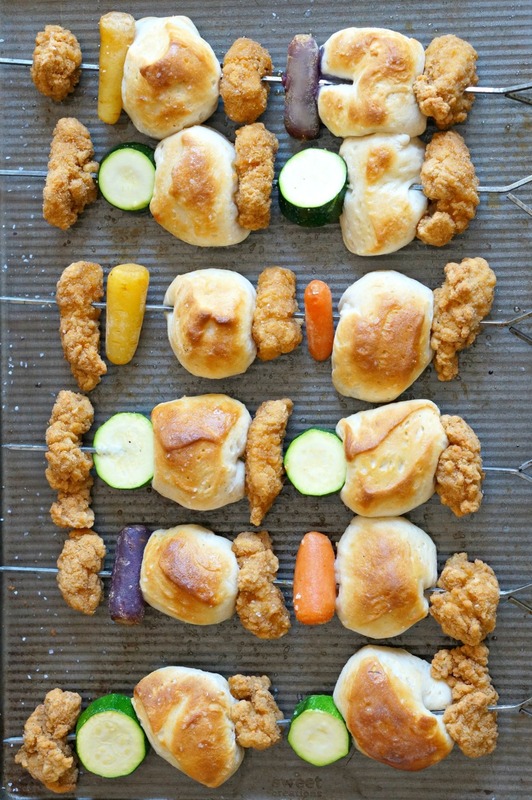 It’s super easy to make, and with Tyson Any’tizers Popcorn Chicken, I know my kids are getting a protein packed meal. Made with white meat chicken and no added hormones or steroids, Tyson Any’tizers Popcorn Chicken are a staple in my freezer. Other varieties available include Tyson Grilled & Ready Chicken Breast Strips, Tyson Chicken Nuggets, and Tyson Crispy Chicken Strips! 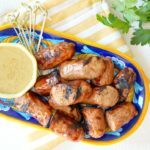 My kids are huge bread fans, so I used biscuits to fill out these skewers, but if you’d rather use potatoes or just load up on veggies, go ahead! 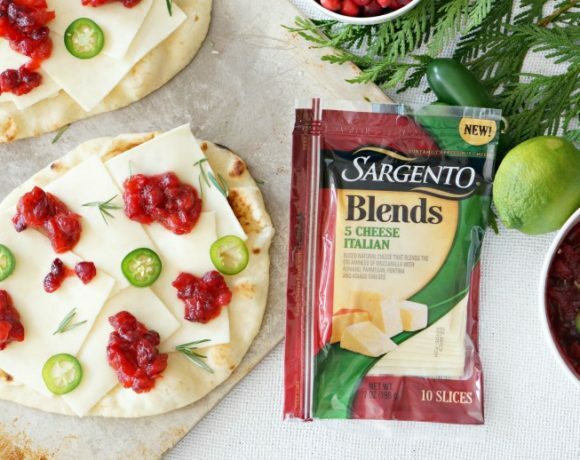 This recipe can be as flexible as you need it to be. 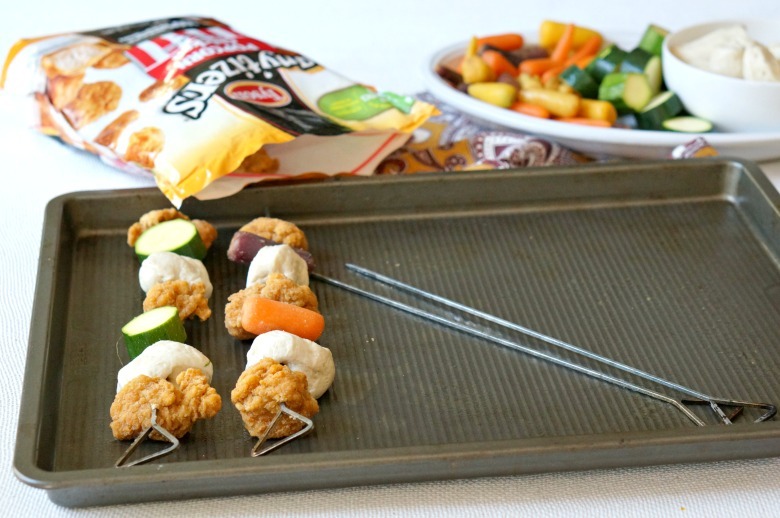 Chicken Nugget Dinner on a Stick is the recipe you need for happy family dinners this summer! 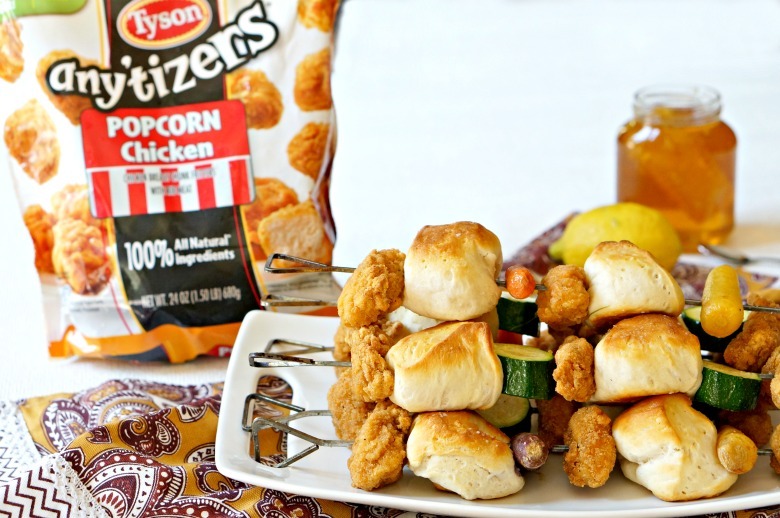 Mix and match veggies with biscuits and Tyson® Any’tizers Popcorn Chicken for a meal all will love. You can find Tyson Any’tizers Popcorn Chicken in the frozen food aisle at Walmart. From 6/14/18-6/17/18 you can save with this Ibotta offer. They will also have in-store demos from the Tasty Videos using Tyson chicken. Place the nuggets on a microwave safe plate and cook for just a minute or so; you want to be able to easily pierce the chicken with the skewer. They won’t be cooked through. Assemble the kabobs, alternating between chicken, biscuits and veggies, ensuring to leave a little bit of space for heat to move around between each piece. 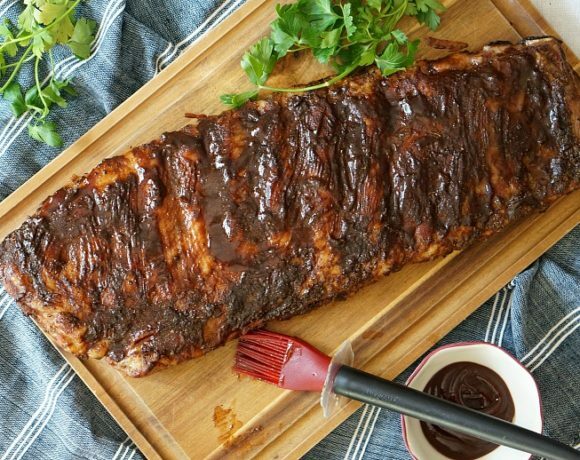 Place on large baking sheet coated with cooking spray. Sprinkle with salt and pepper and bake for about 22 minutes. Until chicken is cooked through and crispy, veggies are tender, and the biscuits are golden. Serve with your favorite dips. 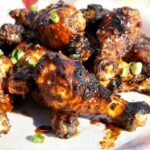 I love these with honey, my husband dips them in buffalo sauce, and my kids? Well ketchup, BBQ sauce and ranch of course. We can’t all agree on a preferred dip, but at least we all agree that this Chicken Nugget Dinner on a Stick is one of our favorite meals! 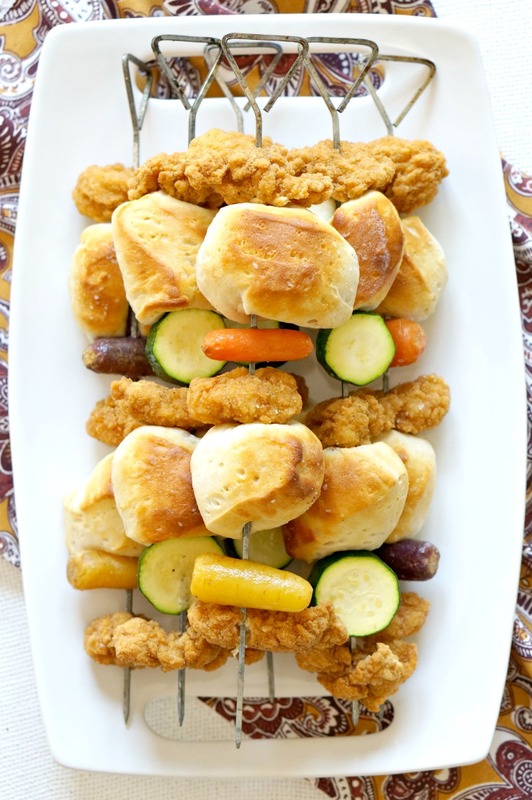 Chicken Nugget Dinner on a Stick is the recipe you need for happy family dinners this summer! 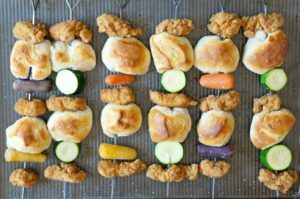 Mix and match veggies with biscuits and Tyson Any'tizers Popcorn Chicken for a meal all will love. Place the nuggets on a microwave safe plate and cook for just a minute or so; you want to be able to easily pierce the chicken with the skewer. They won't be cooked through. Serve with your favorite dips. I love these with honey butter, my husband dips them in buffalo sauce, and my kids? Well ketchup, BBQ sauce and ranch of course. 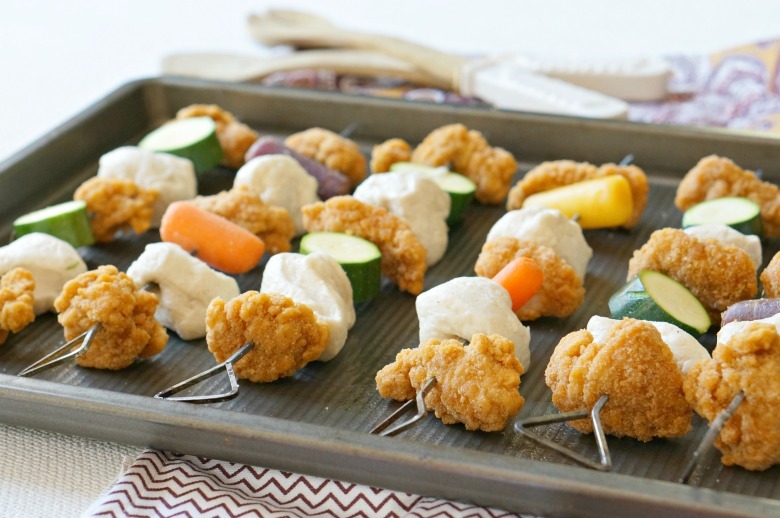 Be sure to visit your local Walmart 6/14-6/17 for in-store demos from the Tasty videos using Tyson chicken and to pick up ingredients for our Chicken Nugget Dinner on a Stick recipe! 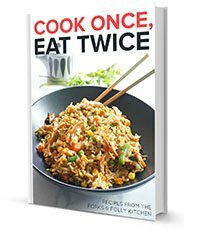 For more recipes your family can enjoy, click here. 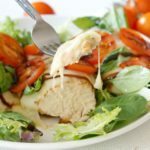 Need some other family friendly dinner ideas for this summer? Try our Moonsquirter Pasta Recipe and Toddler Noodle Soup!